BDswiss review – Premium Swiss quality or a Scam? BDSwiss is very well recognized broker not only in Europe. In the extensive review, we will check company’s background and discover their offer. BDSwiss is a Cysec regulated broker offering FX and CFD trading. The company from its creation in 2003 attracted over 1 000 000 clients from all over the world who found in BDSwiss a safe and transparent enviroment for their trading. The minimum deposit to start trading with real funds is $200, a free demo account is available to anyone. General Risk Warning: 84.1% of retail investor accounts lose money when trading CFDs with this provider. You should consider whether you understand how CFDs work and whether you can afford to take the high risk of losing your money. Types of Assets: Forex, indices, stocks, commodities, cryptocurrencies. Demo account: Yes, free of charge. Methods of deposit and withdrawal: Credit/debit cards, Bank Wire Transfer, Skrill, Neteller. Operator: BDSwiss Holding Plc., Cyprus. Regulated by CySEC (License number: 199/13). At BDSwiss it is possible either to use the WebTrader platform or the MT4. The broker supports speculating on over 250 trading assets. 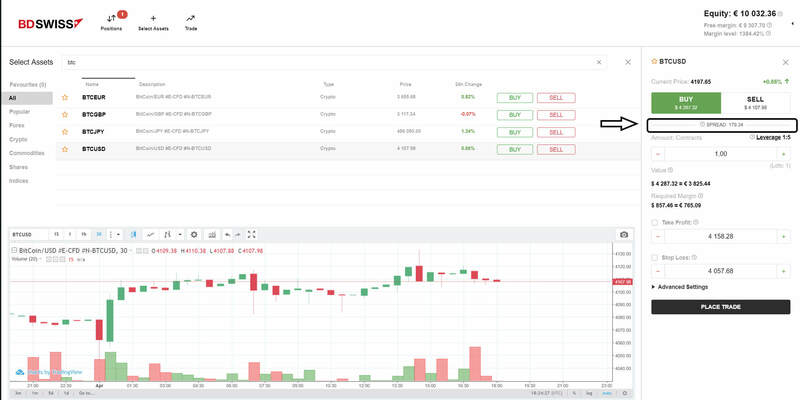 As you can see from the screenshots below, The WebTrader looks very clean and modern. The navigation in the platform is fairly easy. I am, however, missing information about the overnight fee when I open a specific asset. When I also open any stock, there is no mention about the commission fee of 0.15 that is charged when opening and closing positions. 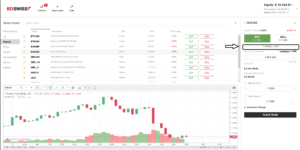 The WebTrader platform features for its technical analysis charts by TradingView. This charting software provides a perfect environment for technical analysis as one can simply change time frames, add indicators, draw all types of lines etc. BDSwiss spreads differ depending on the underlying asset. 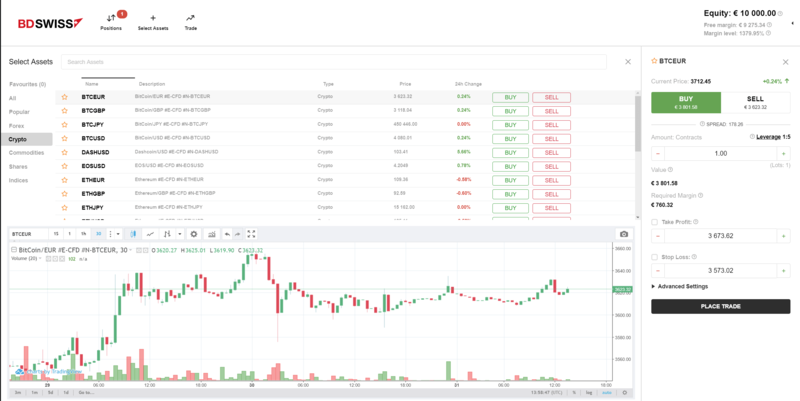 We have tested the spreads on the web trader platform for some of the most popular assets. On the most popular currency pair – EUR/USD is the spread 17 pips, on EUR/GBP 20 pips and on Bitcoin 179 pips. This data was taken on the 01.04.2019. Having this information, we have to say that the spreads are definitely not a feature in which the BDSwiss broker excels. BDswiss also charges 0.15% commission when opening and closing stock CFD position. On other financial instruments, the commission fee does not apply. BDswiss features a wide variety of deposit and withdrawal methods. To finance a trading account one can use popular transfer methods like credit and debit cards, wire transfer, Neteller or Skrill. 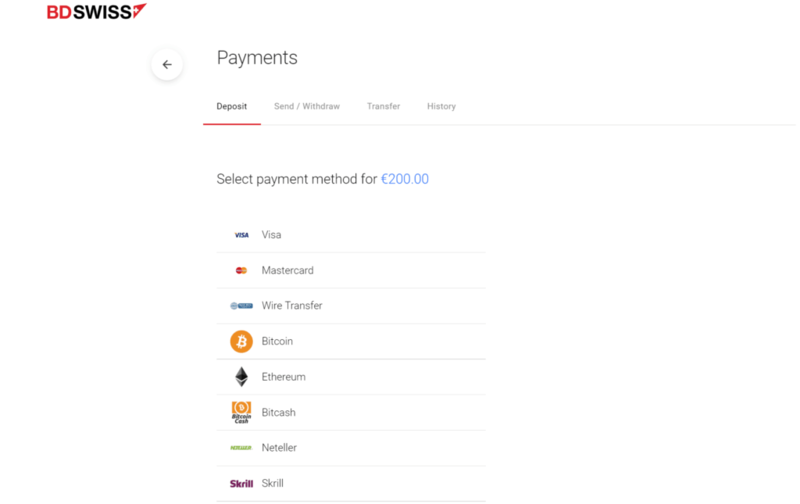 Furthermore, BDSwiss also support payments in Bitcoin, Bitcoin cash, and Ethereum. This is actually the very first CFD/FX brokers we reviewed that offers the option to finance a trading account with digital coins. 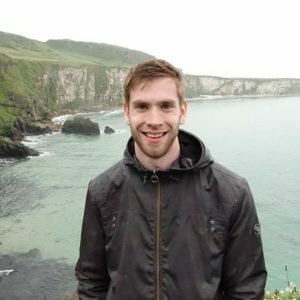 The broker also supports other deposit methods in certain countries e.g. Dotpay in Poland, iDeal in Netherlands or GiroPay in Germany. The deposits are immediately processed, the withdrawals within 24 hours from the made request. The minimum starting deposit is set at $200. BDSwiss clients can have a trading account in the following currencies: EUR (€), USD ($), GBP (£), PLN (zł), DKK (kr), SEK (kr), NOK (kr) and CHF (Fr.). BDswiss clients can speculate on the price movement of popular cryptocurrencies. As of now, BDSwiss supports these 12 digital coins on its platform: BTC, ETH, LTC, Dash, EOS, IOTA, NEO, OMG, TRX, XMR, XRP, Zec which can all be traded against the USD. Bitcoin, as well as Ethereum, are also tradable on the BDswiss platform against Euro, Pound and Japanese yen. LTC is also tradable against JPY and EUR. So as you can see the number of available cryptocurrencies is really superior. When we review the spreads that are charged for cryptocurrency trading, they are a little bit less attractive. BDSwiss clients who want an expert to trade with their funds can participate in the Wealth management program. Each professional trader who takes part in this program can be tracked and you can see his performance metrics (Monthly/daily gain, manager’s capital, trading style etc.). Based on this information you can decide in whose hands you are going to give your resources. Professional traders who want to manage the capital of other investors can apply for a fund manager position. 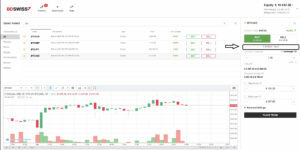 BDSwiss is a popular FX/CFD broker with a good reputation. 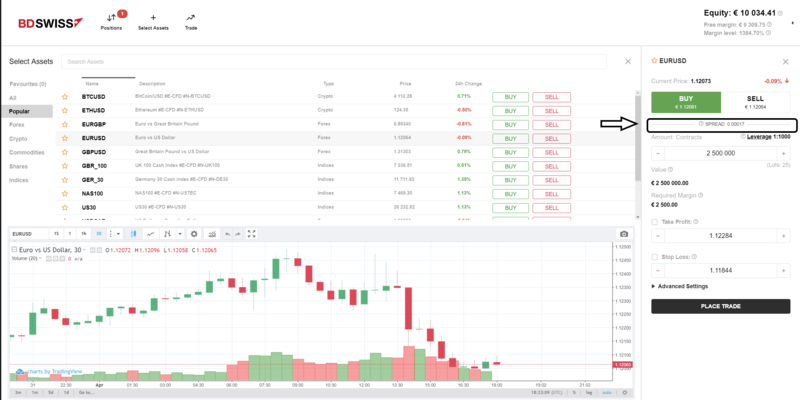 The MT4 Platform on which the broker functions has always provided a safe and modern trading environment. A huge advantage of a big broker as BDswiss is that they fully support 20 languages, so almost every trader can communicate with the company in their native language. As the biggest drawback we see are the spreads, which are in comparison to Plus500, XM.com or other giant CFD brokers quite huge, especially on cryptocurrencies. 84.1% of retail CFD accounts lose money.